The Edgar Allan Poe Review, edited by Barbara Cantalupo, is the official journal of the Poe Studies Association and is published at The Pennsylvania State University Press. Subscriptions for this bi-annual publication come with membership in the Poe Studies Association, a $30/year investment for domestic and international members: FOR MORE INFORMATION, CONTACT CAROLE SHAFFER-KOROS AT ckoros.kean@gmail.com. If you are an institution and are interested in subscribing to the online version of this journal, please contact us at jrnlcirc@press.jhu.edu, 1-800-548-1784, or 410-516-6987. The Edgar Allan Poe Review welcomes submissions of scholarly essays (with abstracts) and short marginalia items related to Poe, his work, and influence. Essays should use Chicago Manual of Style documentation; images are encouraged in either jpeg or tiff format at 300 dpi and submitted individually rather than embedded in an essay. 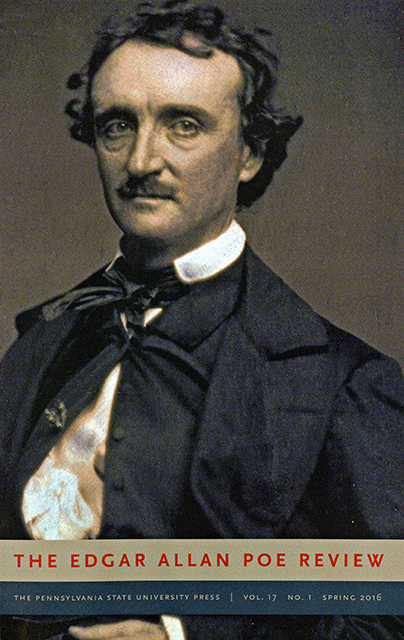 To submit an essay or marginalia item go to http://www.editorialmanager.com/poe/ and follow the prompts. Books, CDs, or DVDs related to Poe can be sent for review to Barbara Cantalupo, Editor, The Edgar Allan Poe Review, Penn State Lehigh Valley, 2809 Saucon Valley Road, Center Valley, PA 18034. All articles from back issues are now available at JSTOR. Beginning with the Spring 2013 issue, they will also be available at Project MUSE. Articles will continue to be listed at the MLA International Bibliography. The former publication of the PSA, the PSA Newsletter was published from 1973 - 2000.